Are you taking advantage of every chance you have to generate new fans and supporters at your special events, galas, fun runs, community fairs, and community education and outreach activities? Don’t waste your chance to make a good impression and start a relationship that could last a lifetime! Special event volunteers require special attention. With proper planning, they can become one of your greatest assets. 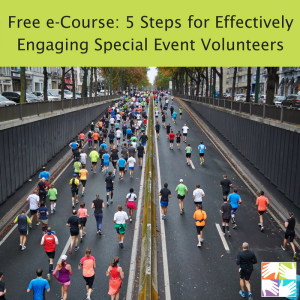 Sign up to learn how your event volunteers can be effectively managed, utilized, and appreciated, with less stress and more fun! Learn how to engage and manage a team of exceptional event supporters that come back year after year to help your event succeed. Here are five tips for making the most of each event and your valuable “face time” with potential future volunteers, donors, and supporters. 1) Set a Goal that Makes Sense — Raising awareness is not a goal; changing a specific behavior is. How can your event help further your mission and cultivate deeper relationships with everyone who attends? Set a volunteer recruitment goal, for example, so you can focus on reaching out to new supporters in addition to attending to the event’s goal. 2) Choose the Right Type of Event — When you are particularly interested in reaching a specific group of prospective donors or volunteers, make sure the event matches the size and personality of the group you are trying to reach. If they are more accustomed formal presentations, bring the laptop and projector. If they are grassroots and are more comfortable just “chatting,” set up a Q&A session with snacks. 3) Secure Corporate Sponsors — Showcasing local businesses, large and small, helps build “social proof” for your organization. Potential volunteers and donors like to see that you have broad support and that they will join a winning team. Your organization may have restrictions against working with businesses that pose a conflict of interest. This doesn’t mean you can’t ask your local supermarket to donate deli items or a cake. Expand beyond the usual suspects. Consider how highly-regarded community partners can support you. Be sure to promote their participation. 4) Design a Dynamic Experience for All Event Participants — Be creative and find a way to include time for personal storytelling at your event, whatever the agenda. Capture hearts and minds. Have volunteers share why they support the organization. Have donors share why they invest in you. Have clients tell why your work has helped them. If you can’t do this in person, be sure to have videos, posters, or handouts that can convey this important information and breathe life into your mission. 5) Assess What Worked (and What Didn’t), Plan for Next Time and Keep Up Your Relationships — Gather complete event participant contact information. Ask them directly to indicate how they want to be involved. At this point, they may only want to receive your newsletter. That’s fine, you can start building your relationship from there. Make sure they can also show an interest in volunteering or make a donation on the spot. Follow up immediately after the event.